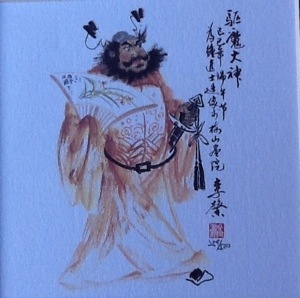 Chung Kwai (aka Zhong Kui) is a mythical, Chinese hero who can not only see but catch ghosts and evil spirits. They are, therefore, afraid of him and so if you have bad spirits in your home you should display a picture or statue of Chung Kwai to keep them away. What about this? 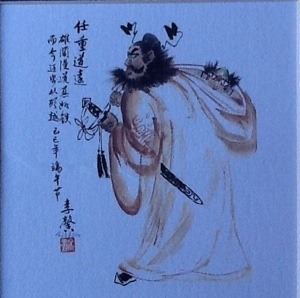 These are three mounted, original and numbered prints of Chung Kwai by a Hong Kong artist called Lee Ngo. Here are close ups of the three prints. I think he looks rather splendid and the artist has given him a lot of character but I wish I could read the writing! 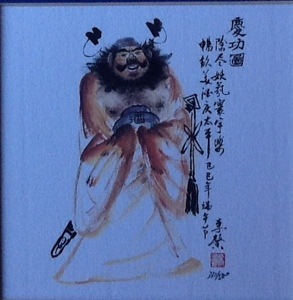 I have tried to find out something about the artist but all I know is that he was born in 1952, in China, and moved to Hong Kong in 1970. I have found a few of his works on auction sites and they seem to be of similar quality but little or nothing about the man himself. I bought this for £1.99 and I believe it should be worth much more. It is a wonderfully interesting story and it wards off evil spirits as well! Every home should have one (or three for the price of one).